Philippines - The Philippine Atmospheric, Geophysical and Astronomical Services Administration also know as PAGASA reported earlier that Typhoon Ompong (international name Vongfong) will not make landfall in the country, as of 5 PM advisory today, October 8. PAGASA estimated Typhoon Ompong to move west northwest at 9 kph. It was located at 995 km east of Tuguegarao City (18.3ºN, 131.1ºE) based on all available data of state weather agency. According to PAGASA forecaster, Ompong reached the status on category 5, and JTWC stated that the typhoon could reach its peak strength on Thursday morning, October 9, packing one-minute sustained winds of 305 kph and gusts of up to 370 kph while it is over the Philippine Sea. The Hawaii-based Joint Typhoon Warning Center also added that Ompong will get weaker as it approaches the southern portion of Japan. State weather agency advised the residents of Metro Manila, MIMAROPA, CALABARZON, Bicol region, Visayas, Zamboanga peninsula, ARMM and northern Mindanao, they will experience cloudy skies with light to moderate rainshowers and thunderstorms. We all know what super typhoon Yolanda done in the Visayas region in 2013. 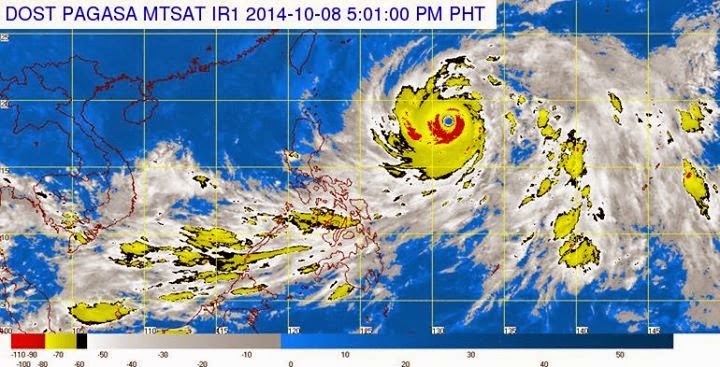 Yolanda was packing one-minute sustained winds of 310 kph and gusts of up to 380 kph that time. The strongest typhoon that make landfall in the country. But PAGASA said Filipinos can heave a sigh of relief as the massive cyclone is not expected to hit the Philippines. For more Bagyong Ompong related information, kindly bookmark this page and share to your joined social networking sites. Comments or suggestions about " Bagyong Ompong (Vongfong) Year's Most Powerful Storm" is important to us, you may share it by using the comment box below.